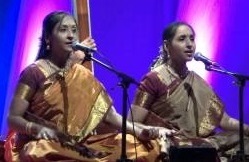 Uma and Radhika’s talent in music was identified at a very early age by their parents Sri R. Natesan & Smt. Bhavani Natesan, who took it upon themselves the task of showing them the right direction. 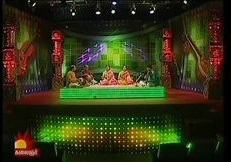 They were initiated into music by their mother Smt Bhavani Natesan, rigorous musical training began right from their childhood, initially from Isai Peroli Neyveli Sri R. Santhanagopalan and later on from Padma Bhushan Madurai T N Seshagoplan and they continue to remain under their able guidance even now. The duo come from a family of ardent devotees of Swami Chinmayananda. Having received his blessings they have been named Chinmaya Sisters by their Guru. They recall with pride, meeting Swami Chinmayananda and seeking his blessings to begin their musical journey as “Chinmaya Sisters”. They were brought up in Mulund, Mumbai and lived there for nearly 17 years. While in school, they were the most sought after singers and won several prizes in interschool and intercollegiate competitions and also from reputed Sabhas like Shanmukhananda Sangeetha Sabha, Tamil Isai Sangam, Mulund Fine Arts Society and Bharatiya Music and Arts Society. Their childhood years saw them making frequent trips to Chennai, not just to learn music but also to listen to concerts especially during the December Music Festival. The big decision to relocate to Chennai was taken in 1991 so as to enable Uma and Radhika to devote themselves fully to music. Since their debut performance in 1992, their musical journey has been very interesting and successful with Innumerable concerts all over India and abroad, rave reviews for their concerts, great appreciation from the audience and accolades from Sabhas . To them, music is not just an art form but something that connects them to the divine. With the blessings of the Almighty and their Gurus they hope to scale greater heights in the future!